Generate beautiful MIDI patterns and melodies for your tracks! 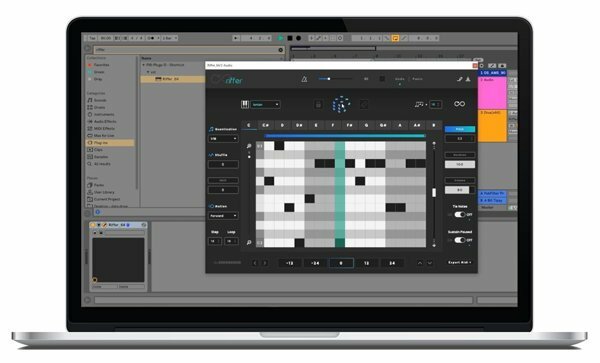 Riffer by Audiomodern is a smart MIDI sequencer that generates random Riffs for your Sounds, Software & Hardware. Riffer comes in VST & AU format and it is designed to feed anything that accepts MIDI signal, both Software & Hardware. Generate fresh ideas, sequences, melodies, riffs and musical patterns. Turn them into something of your own or let it run endlessly using the infinity mode. Riffer is built both for studio and live performance. What a cheeky little monkey this is for the price. It’s endless amount of variable rifts that it creates is endless. The good thing about it is, that it’s tempo related so that you can create Orchestra rifts, and also arpeggiator’s with it. AudioModern are a little different from most, and well worth a look at. Works excellent with Logic and also to trigger my Model D and Neutron hardware synths. Very lightweight and creative. Audiomodern Riffer is a very versatile tool when stuck for ideas with its random sequence, duration and volume button. You can come up with very complex sequences. I would highly recommend Audiomodern riffer.